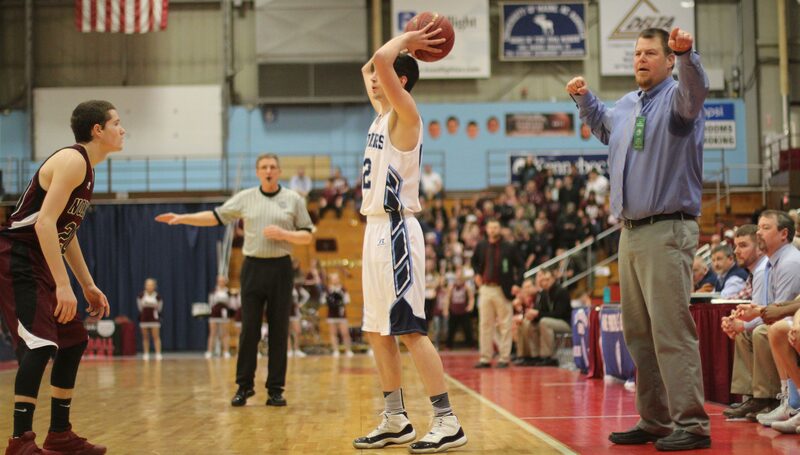 (Augusta ME) This game was there for the taking until Oceanside’s Cooper Wirkala sank two free throws with 2.3 seconds left. 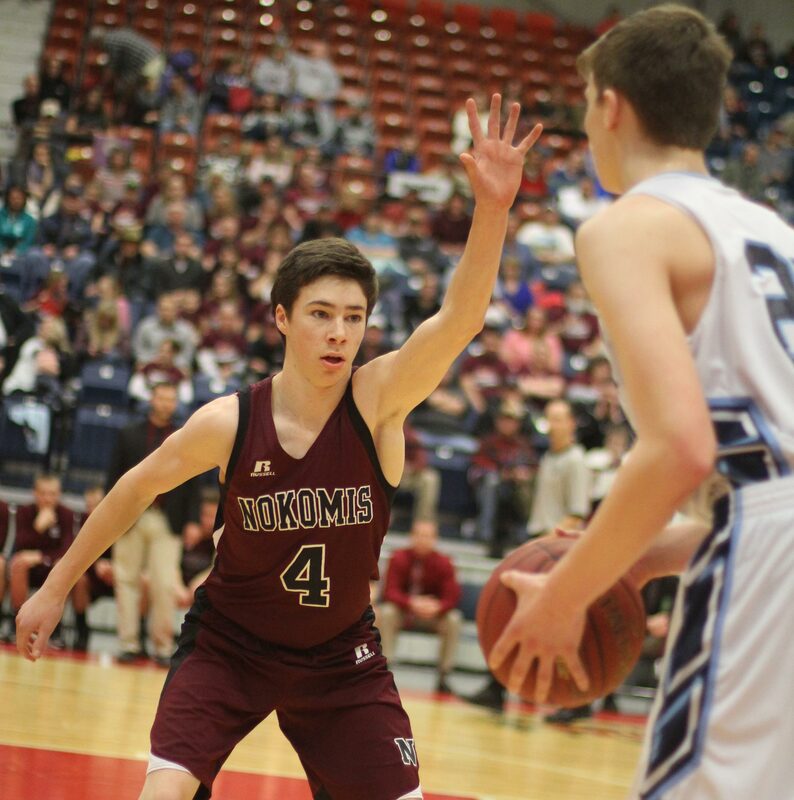 The two free throws put the Mariners up by four and sealed a 53-49 win over plucky Nokomis in the Class A North quarterfinals on Saturday afternoon at the Augusta Civic Center. 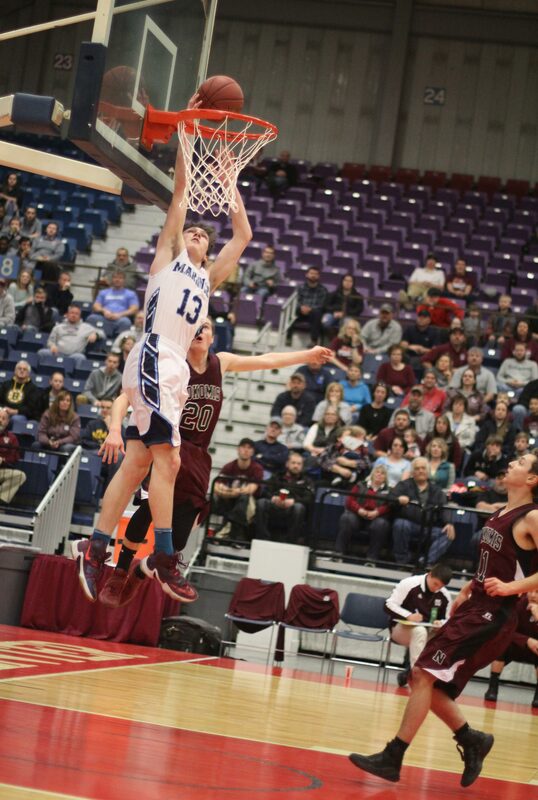 #3 Oceanside (16-3) made it to the Class A championship game last season but graduated eight players. They have quickly rebuilt around junior Mike Norton. Mike (6’2”) ended up with twenty-seven points today getting in close for layups and making room for jump shots in the lane. Mike had eighteen of those points during Oceanside’s rally from a 16-4 deficit in the first period to a 28-22 lead early in the third period. Mike had two steal/layups in his collection of scoring. The hustle play of the game? Mike Norton catching a Warrior dribbler with his back turned and diving to force a jump-ball turnover on Nokomis in the 4th period. 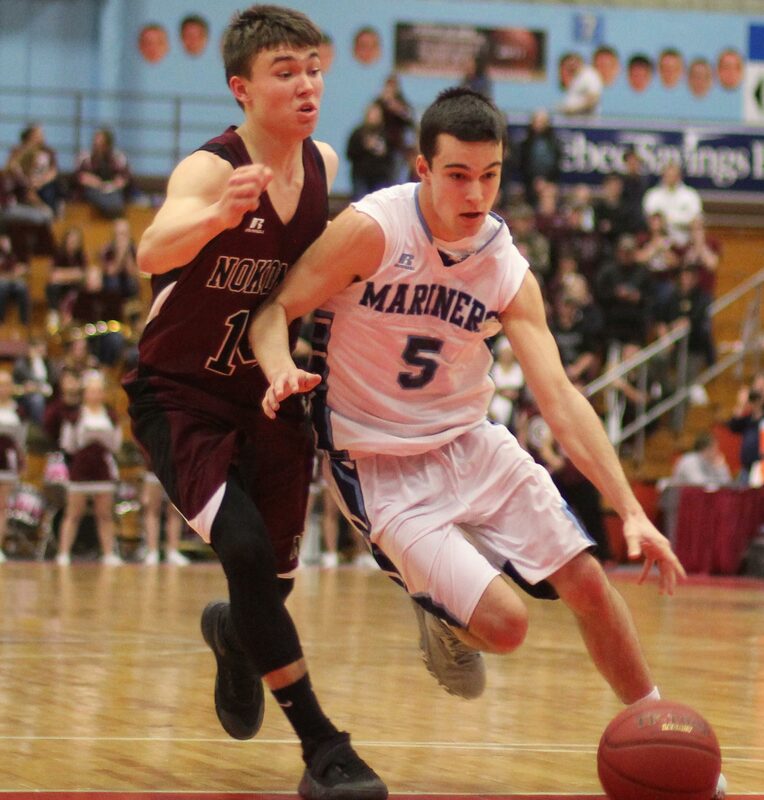 Mike’s heroics were important to get the Mariners going after Josh Smestad (22 points) punished the Rockland team with half his points in the first quarter. The thing about Nokomis (11-8) was that after squandering their great start they did not fold thereafter. Down by six (28-22) early in the 3rd quarter, the team from Newport rode the shooting of Zach Hartsgrove (17 points) to get to within two points of the lead five different times in that quarter. 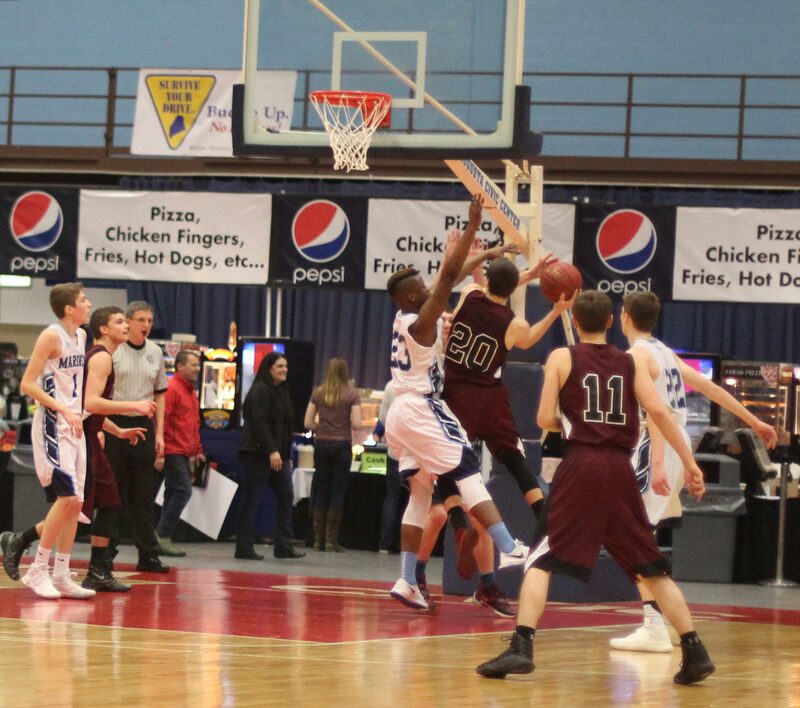 With 4:25 to go in the game the Warriors actually took the lead, 42-41, on a baseline jumper by Captain Brad Allen. 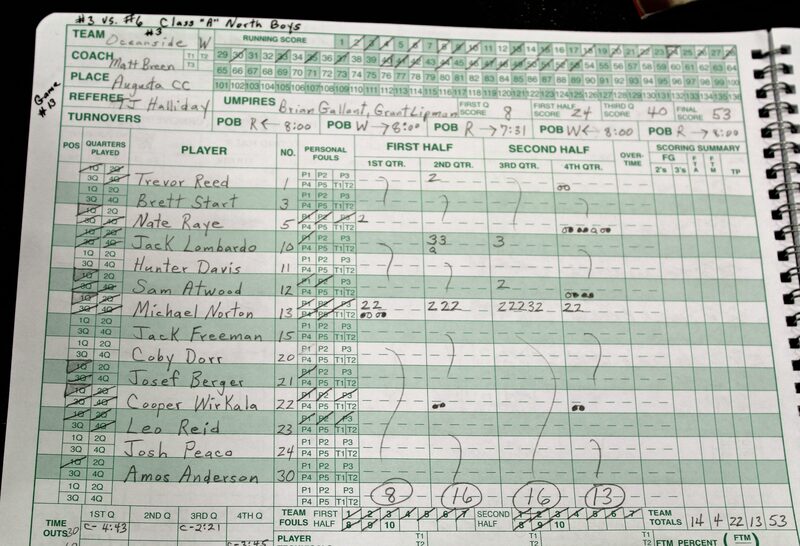 Back came Oceanside, and after two more hoops by Mike Norton, one assisted by Nate Raye, they were in front, 46-44, with 2:48 remaining. Key point in the game? 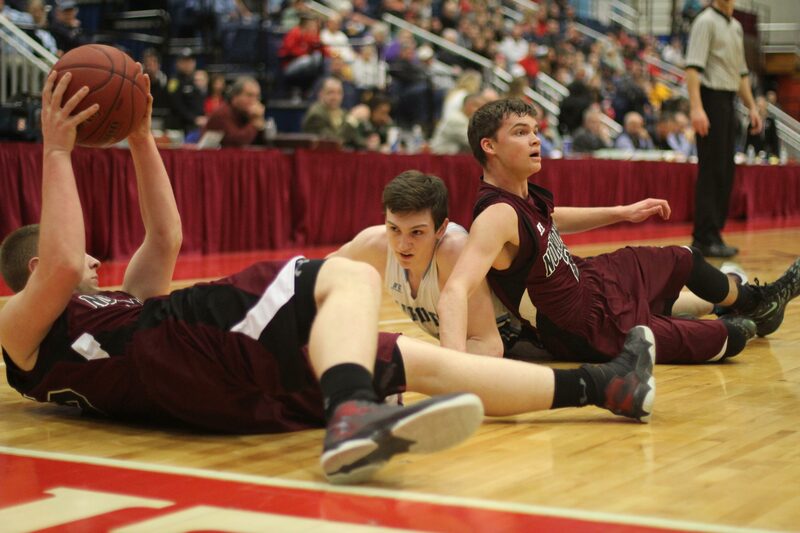 Mike Norton fouled out with 2:10 left. How would Oceanside get points the rest of the way? 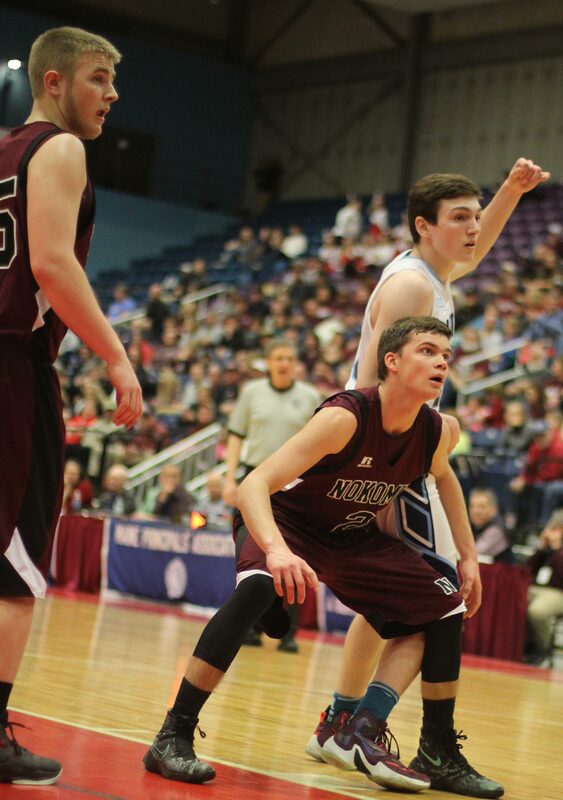 Here’s how: four Oceanside free throws came from Nate Raye and Sam Atwood surrounding a Nokomis turnover. Now up five (50-45) with a minute left things looked good for Oceanside. Not so fast! The Mariners missed five of their next six free throws and had a turnover. 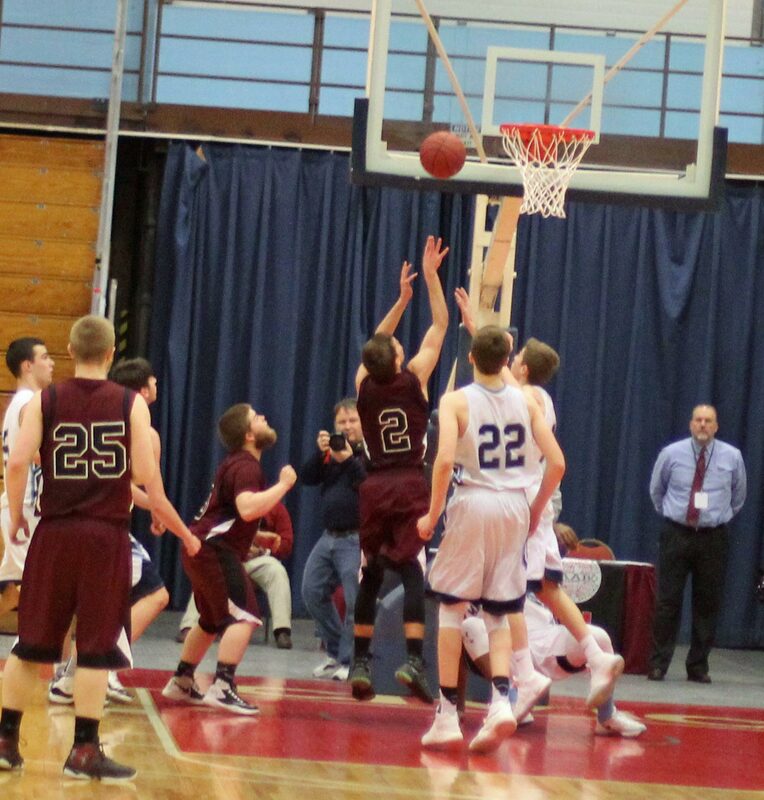 Meanwhile, Zach Hartsgrove made two free throws and teammate Josh Smestad converted an offensive rebound. 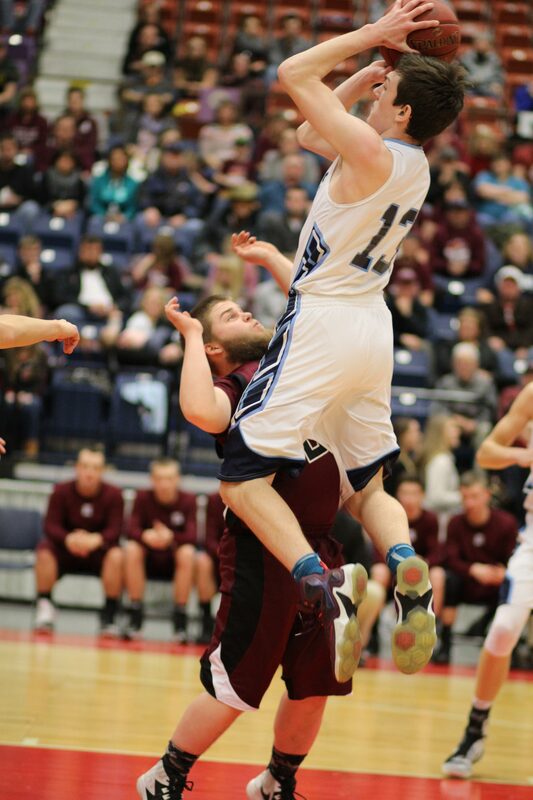 The Warriors were within two twice, with the ball, in the final twenty-two seconds. 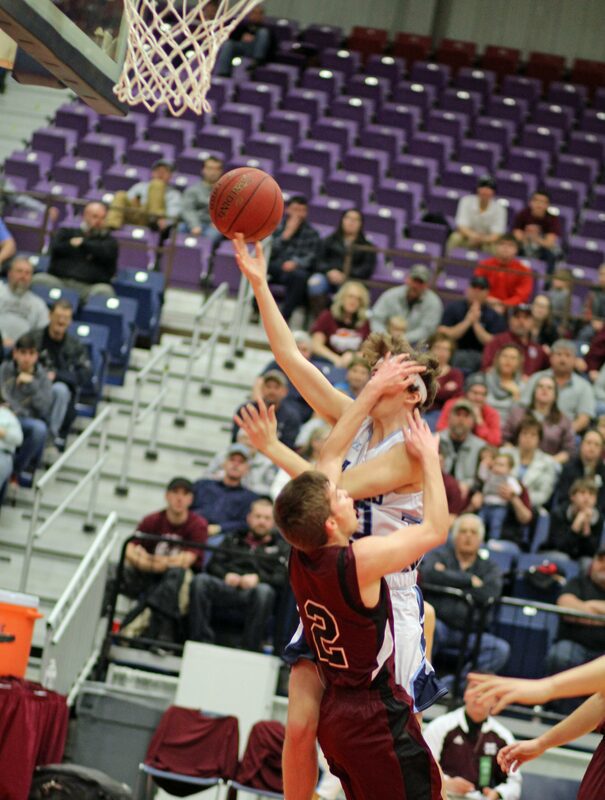 Zach Hartsgrove missed contested shots in both possessions. 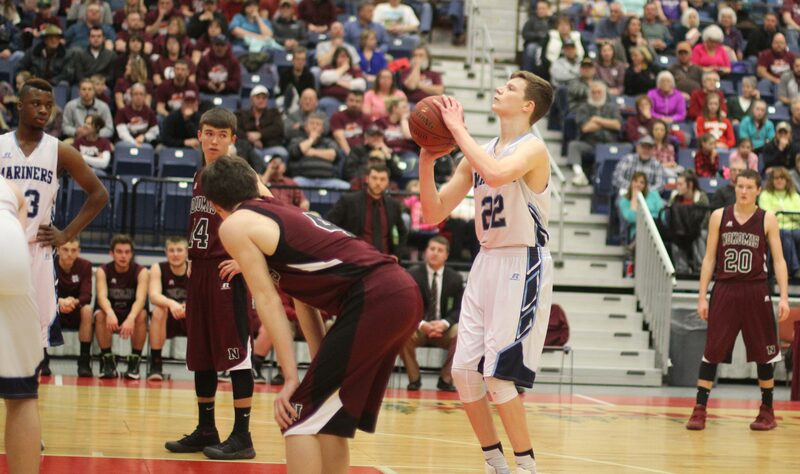 After the second miss, Cooper Wirkala took in the rebound, was fouled, and sealed the deal with two straight free throws. This was definitely a game that could have gone either way. Oceanside gets to play in the North semi-finals on Wednesday at the same location. The North finals will be on Friday. The Class A title game will be in Augusta on March 4th at 2:45PM. Oceanside has now won six straight. 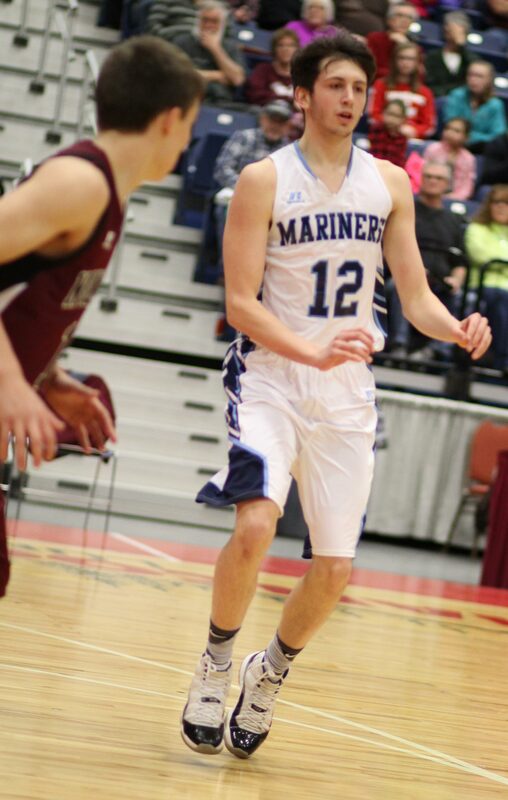 The Mariners lost to undefeated Medomak Valley, 55-51, on January 27th. 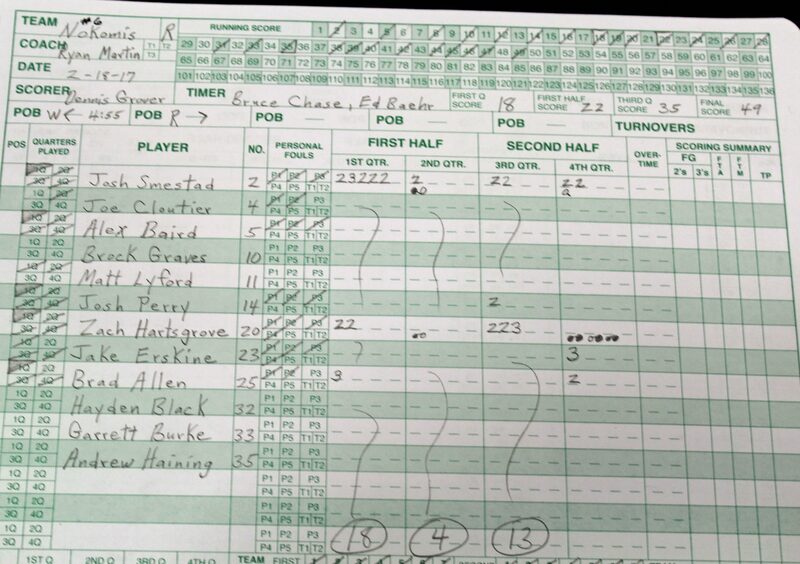 There were eight charges called in this game. The Nokomis band performed (nicely) the National Anthem. It was a blessing to have dry roads and sunny skies. Floor scramble. Brad Allen with the ball.